The Naini Peak is located at a close to the main town center of Nainital. It rises up to an altitude of 2611 m above the sea level. It takes around 30 minutes to travel from the main town center to the foothill of the peak. You can enjoy breathtaking view of the entire town and also the snow capped mountains located at a distance. On a clear sunny day, you may also be able to see Nanda Devi and other peaks like Trishul. The mountains of Bandar Punch lie in the Wst and the Api and Nari peaks of Nepal are located in the East. 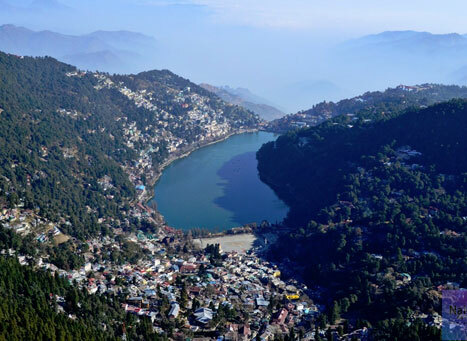 From the top, the Naini Lake shaped like an eye can be clearly seen. The mountain is located at the backdrop of the Naina Devi temple. The road to the beautiful Naini Peak in Nainital is full of vegetation. The entire area is covered with rhododendrons, deodars and cypresses. There are small streams that can be seen from a distance. If you are a lover of adventure, then the Naini Peak is also an ideal place for you to visit. The geographical locale on the peak makes it a perfect place for trekking and mountain hiking trips, and mountain biking trips. The rugged terrain in the area and the steep and winding paths has always attracted trekkers and adventure lovers to undertake Nainital mountain biking trips. It requires immense physical strength and technical skill to overcome the steep hills while mountain biking. Lodging facilities are easily available in Nainital around the Naini Peak. There is a wide range of hotels and nature resorts which offer pleasant lodging facilities and services. Getting to the peak is easy and convenient. Buses and cars ply between the town and the peak. There are also sightseeing trips that are organised to the peak. To get more information about these trips, you can contact the local tourist office.